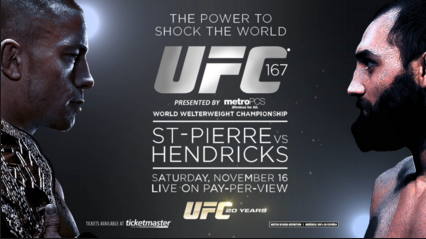 Fort Wayne, Indiana – Plaintiff Joe Hand Promotions, Inc. of Feasterville, Pennsylvania filed an intellectual property lawsuit in the Northern District of Indiana asserting unlawful interception of Plaintiff’s program “Ultimate Fighting Championship 167: Georges St. Pierre v. Johny Hendricks” on November 16, 2013. This lawsuit is in addition to the litigation commenced by Plaintiff in the Southern District of Indiana on Thursday. The complaint filed in the Northern District, filed by an intellectual property lawyer for Joe Hand, was nearly identical to Thursday’s complaint, with the primary difference being the Defendants named. In this lawsuit, the Defendants listed are Glen Robert Dotson, individually and d/b/a Fatzboyz Bar & Grill, and Dotson R. Inc., also d/b/a Fatzboyz Bar & Grill of Ligonier, Indiana. Defendants are accused of “depriving Plaintiff of the commercial license fee to which Plaintiff was rightfully entitled to receive from them” by showing the championship fight without having purchased a commercial license from Plaintiff. Under Counts I and II, Joe Hand seeks statutory damages for all violations of 47 U.S.C. § 605 and 47 U.S.C. § 553, including additional damages for willful violations, where appropriate. Costs and attorney’s fees are also sought. A claim of conversion is included as Count III. The case was assigned to District Judge Joseph S. Van Bokkelen and Magistrate Judge Susan L. Collins in the Northern District of Indiana and assigned Case No. 1:15-cv-00340-JVB-SLC.